NBA legend Bill Russell sat in a wheelchair with two handlers nearby on Monday night outside of Oracle Arena as he waited for his private car to arrive. The 11-time NBA champion’s work was not done. Had the Golden State Warriors clinched their second straight championship, Russell would’ve handed out the Most Valuable Player trophy named after him. Instead, the 82-year-old is heading to Cleveland for Game 6 in this suddenly interesting Finals series. Shortly after Russell departed, so did suspended Warriors forward Draymond Green, who wasn’t even allowed in Oracle. He had watched his team’s excruciating loss from a suite next door at the Oakland Coliseum. There would be no championship party to crash, just more basketball to play. With Game 5 over, Green headed to his SUV, escorted by security. He was eventually joined by ex-NFL star Marshawn Lynch. This was not the kind of night Green had envisioned for the Warriors. It was bad enough that he had to sit out Game 5, the result of an altercation with LeBron James during the Warriors’ Game 4 win in Cleveland. James had stepped over him and Green responded by swinging his arm and making contact in James’ groin area. For that, the league assessed him a flagrant foul 1, his fourth flagrant foul point of the postseason, triggering an automatic suspension. News of the suspension Sunday night had nearly brought Green to tears, according to a source, knowing he couldn’t help his “brothers” in a possible championship-clinching Game 5. Had Golden State won, NBA rules would have allowed Green to enter Oracle for the championship celebration. But to do that, he needed to watch the game somewhere nearby. Watching it at home was not an option, given Green lives high up in the Berkeley-Oakland Hills area and would likely have been late for the champagne spraying. The San Francisco Giants offered him tickets to their game against the Milwaukee Brewers, but that would have meant an even further drive than from his home. So Green got as close to Oracle Arena as he possibly could, hanging out next door at Oakland Coliseum, where the Oakland Athletics were hosting the Texas Rangers. He declined an offer to throw out the first pitch and showed up for the game about an hour early as the Warriors and the Cavaliers were readying to begin Game 5 without him. With his friend and former Seattle Seahawks back Lynch along for moral support, Green watched the game from an A’s suite. The spread was typical ballpark fare: chicken fingers, hot dogs, popcorn and chips. Green wasn’t too interested in hearing the broadcast commentary, so he turned the volume low on the television, a source said. He was in a baseball suite, but he wasn’t paying attention to the Athletics’ 14-5 rout of the Rangers. His concentration was on his teammates. Lynch, an Oakland hometown celebrity in his own right, tried to keep an eye on both games. Green was also joined by Warriors general manager Bob Myers, Nike shoe representative Adrian Stelly, his personal manager Jaquail Jacox, his agent B.J. Armstrong, and other friends. 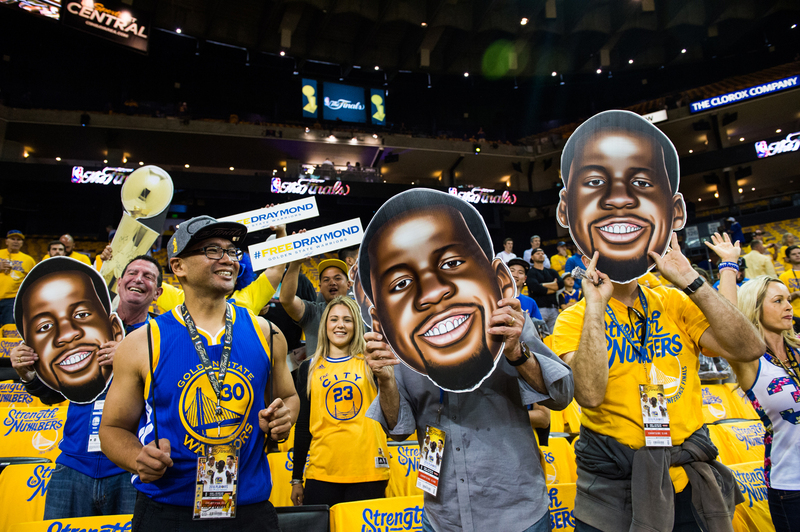 Despite his suspension, Draymond Green is present in spirit as fans have fun with cardboard cut-outs of Green in the stands prior to the start of Game Five of the 2016 NBA Finals. Golden State Warriors against the Cleveland Cavaliers during Game Five of the 2016 NBA Finals at ORACLE Arena on June 13, 2016 in Oakland, California. Watching the game was painful for Green. He was “hurting,” according to a source. He yelled at the screen in disappointment as the Warriors’ struggled defensively, allowing Cavs All-Stars James and Kyrie Irving to combine for 82 points. There was nothing Green — a first team NBA All-Defensive Team selection — could do. Myers departed from the suite when Warriors center Andrew Bogut suffered a knee injury, but eventually came back. Green too was nervous about Bogut’s injury. Once it became apparent late in the fourth quarter that the Warriors would lose, Myers left for good. A group of fans had amassed outside the suite, chanting, “MVP…MVP,” to salute Green. With no bathroom in the suite, Green had to fight his way through the crowd to the public restroom, where fans, no doubt were excited or perplexed to see the Warriors star amidst them. Losing, though, was difficult. Green was said to be visibly disappointed as it became apparent that a 112-97 loss was on the horizon. There would be no late-game heroics, no Hollywood ending. Draymond Green, soul of the Warriors, would not descend on Oracle Arena in street clothes to enjoy a second straight championship. No champagne showers. As Game 5 wound down, and the realization of a Game 6 hit him, Green changed his demeanor, a source said, and became increasingly excited about the challenge ahead. Game 6 is in Cleveland on Thursday, June 16, a year to the day that the Warriors won the 2015 NBA championship in the same venue. Once the buzzer sounded, Green and Lynch skipped the rest of the baseball contest and dealt with a mob scene of wild fans interested in touching them, taking pictures and getting video. Security tried to give Green breathing room. Two cameramen waited in hopes of getting video of Green in a tunnel. Green’s security detail, however, ushered him out a back door to his SUV. What awaited him: bad parking lot traffic. Meanwhile, his Warriors teammates were in the locker room lamenting the loss without him. Although he watched the game with the sound low, Green heard that James received his share of loud boos. Now, as the series heads back to Cleveland for Game 6, the boos will likely turn to Green. Meanwhile, Bill Russell waits, yet again, to see if he can finally pass out the MVP trophy named after him.